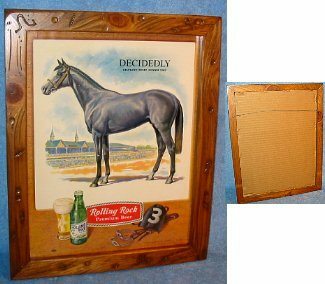 Rolling Rock sign; 11 x 14 inch, pressed board sign with a laminate finish. This is the second in the series featuring 1962 Kentucky Derby winner Decidedly. They issued these soon after the races. This one is in really great shape and is in a nice frame for hanging. These signs really look great framed.